Below is a review I wrote as a response to an exhibition at Host Gallery in 2012, and also forms part of my submission to The Critic on Ideas Tap – this time with images. I’ve posted about this project before, but I do find it an inspiring, well conceived and above all brilliantly executed piece. 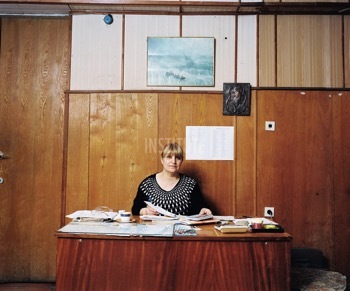 In Abkhazia, a forgotten corner of Russia’s vast landmass, emptiness and decay are everywhere. Two-thirds of the population of Sochi a resort town on the Black Sea have been driven over the border to Georgia. 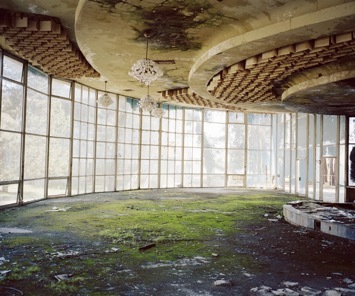 Landscapes are battered, pock marked and strewn with abandoned buildings. Empty interiors are as welcoming as mausoleums and cracks are crudely filled with mortar – but there are no attempts to hide the scars. People are unsmiling and melancholic behind their resolute faces. 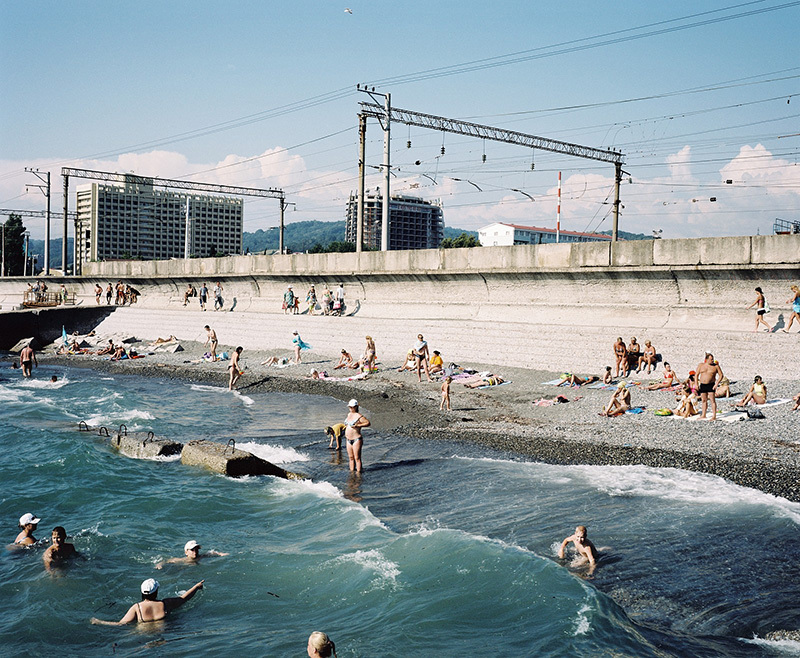 In this current exhibition of the work of photographer Rob Hornstra, we see the hidden cost of recent Russian history etched into every image. Pictures representing deceased war veterans evidence the cost of independence to this fragmented state. 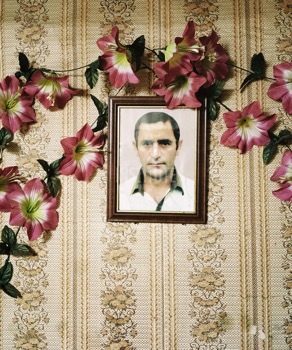 Family portraits are tacked onto floral walls, or occupy their own reverential space in vernacular wooden frames as formal reminders of their sacrifice. By including these images, Hornstra has handed the role of narrator back to the Abkhazian people. One can only applaud this decision as it connects the viewer on a deeply personal level to the deceased, and their relations who covet their chemical imprint. Photo of a deceased husband in a refugee centre on Shamgona island. Many Georgian women who were forced to flee Abkhazia lost their husbands. 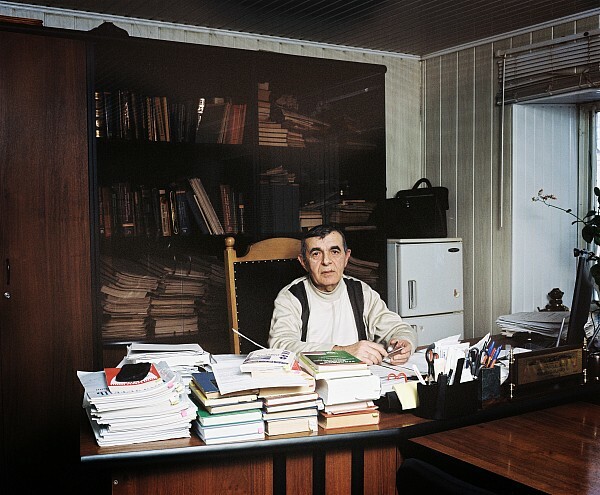 Such intimate pictures contrast starkly with more formal portraits of bureaucrats, slotted between pine desks and pine-paneled walls. They seem imprisoned like marionettes in their wooden worlds. Behind one desk bound official a painting of a sinking ship lurks like a premonition. Behind another a tiger’s head emerges. Danger, it seems, is never far away in the Caucuses. This exhibition is a poignant and sensitive portrayal of a largely unrepresented community. 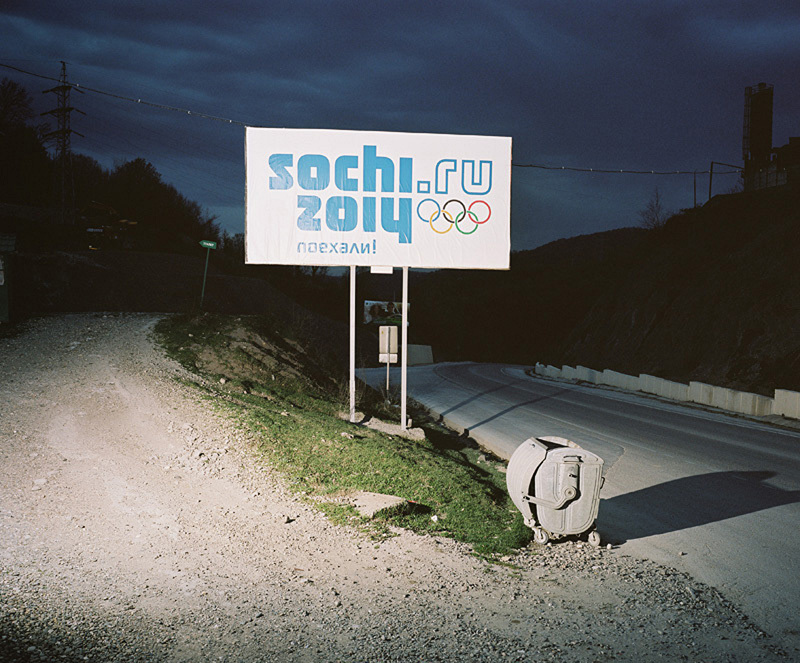 Aptly, Hornstra’s sympathetic, nuanced approach – re-enforced by the looming presence of the 2014 Winter Olympics – allows the complexities of the subject to emerge, justifying this long form style of photojournalism and the project’s beguiling array of printed and digital media. This ironic quote was reported by Arnold van Bruggen (at a recent talk at the Frontline Club) as the main criticism from the Russian ‘blogosphere’ of the Sochi Project’s coverage of the build up to the Russian Winter Games. Together with Photographer Rob Hornstra, the pair have devoted their lives to the region over the last 5 years producing 10 separate publications and an insightful website that can best be described as a compendium of stories from a troubled region given scant coverage in the mainstream media. The aim of the project is an ambitious one. It seeks to disseminate stories – political, ethnographic and cultural – to a broad audience both within Russia and elsewhere. It uses a variety of means to do this, which all rely on the close bonds formed during many re-visits to the region. These return trips add further layers of material which are then compared and added to the encyclopaedic narrative, then made into books, newspapers, poster campaigns or shared on the web. This long-form or ‘slow’ journalism is particularly suited to a variety of media with varying emphasis given to pictures or text. The book ‘Empty land, Promised Land, Forbidden Land’ (re-printed 2013) for example, gives equal weight to both. Chapters guide the reader through a narrative web, the strands of which – appropriately – can only be fully appreciated with time and effort. In this regard, Hornstra’s photographs achieve a certain stateliness and formality which mirrors the lurking presence of state authority. Many of the images allude to memory and trauma – photographs of photographs, decay and dereliction – or highlight bureaucracy in all it’s monotonous repetition. The photographs, however, become a perfect medium to relay this stasis – paralysis, one might say – being themselves a form of preservation. The success of the project is primarily due to two overarching factors. Firstly, there is a successful marriage between content and presentation: where design and layout combine to present both text and image in a beautifully approachable and tactile form. Credit here must go to designers and cartographers Kummer and Hermann, who have given the body of work its distinctive style. Second, despite the breadth of the project, the looming presence of the Winter Games in Sochi provides an anchor point around which stories revolve like constellations. In short, this project provides a possible template for other committed story tellers keen to engage a large audience over an extended time-frame. The pair may well have been listening to Chimamanda Ngozi Adichie during her TED talk in 2009. She warns of the dangers of a single story representing a stereotypical point of view. Admittedly the Caucusus as a geopolitical region are so under-reported that stereotypes are hard to imagine. Nevertheless, their approach seems to avert the kind of criticism normally leveled at photojournalists. An intelligent and thought provoking project which challenges photojournalists to commit to their subject – becoming investigators, not just voyeurs.